The Union of Local Councils held a special event in honor of Rosh Hashanah in which Prime Minister Benjamin Netanyahu, Union Chairman Haim Bibas, Chairman of the Regional Councils Center Amir Ritov ,and about 100 heads of local authorities from various parts of the country participated. 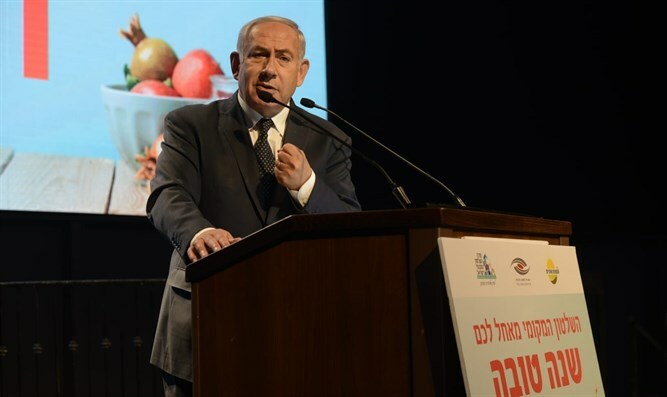 Prime Minister Netanyahu stated at the event that the government had set a goal of investing in the Galilee communities as it had invested in the Negev. According to the prime minister, this will be done through extensive infrastructure development and support for private companies in order strengthen the local economy in the developing towns and to turn them into full-fledged cities. Netanyahu also pointed to recent positive trends in the reduction of of social-economic gaps in Israeli society, as shown in the significantly lower ranking Israel received in the Gini Index, which measures inequality in various countries. "We all want to have a strong state, an advanced state, and we all want to work together for the benefit of all citizens of Israel, all without exception - Jews, Druze, Christians, Muslims, Bedouins, Circassians, Bahá'ís - all citizens of Israel, without exception," Netanyahu added. The chairman of the Union of Local Councils, Haim Bibas, thanked the Prime Minister for his steadfastness with the local authorities and his help in advancing many programs in an unprecedented budget for the residents, including Plan 922 for the advancement of the Arab sector. "In recent years, local government has become a driving force in Israeli society, and today, we act in unity and cooperation and constitute a significant force in the Knesset and the government. The media offensive prevents good people from running for mayor, and we must improve the protection of elected officials. Crucially, we intend to enact a law that will protect elected officials," Bibas said.